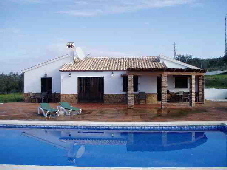 A very nice villa located in a good area with excellent views to the Málaga bay and mountains. Fabulous semi-detached villa situated alongside the first fairway on the desirable Lauro Golf course complex. Panoramic views across the golf course and onto Mijas mountain. Bright and very spacious three bedroom apartment in luxury development in Nueva Andalucia near Puerto Banús. A traditional style finca with many lovely rustic features, situated close to the town of Alhaurín el Grande.